Founded in 2008, Haystack Joinery is a design-build studio dedicated to building timber structures and other custom woodwork with a sculptural sensibility. Our frames are hand-crafted using traditional joinery techniques from both western and eastern woodworking traditions. You bring us the seed. We do not have kits or packages. Every structure we build is unique and designed to best fulfill the functional and aesthetic needs and desires that you share with us, with special consideration given to the unique character-istics of the building site. Some of our clients come to us with an existing floor plan or set of prints that acts as the starting point. Timber frames have some structural constraints that differ from conventionally built structures but most house plans can be readily adapted to a timber framework. We use modeling software to develop a set of drawings that helps to visualize what the proposed structure will look and feel like. These drawings include floor plans, elevations, and isometric perspectives of the proposed structure. Building with timber, carefully crafted with mortise and tenon joinery, is a labor intensive way to build. But each structure that is put together with this level of care and attention to detail is a living refutation of today's culture of disposability and built-in obsolescence. These buildings are built for the centuries; they will be used and loved for generations to come. Aside from material provenance and energy efficiency, building green means building structures that future generations will acknowledge as worth taking care of--that will last not only because they are built well, but because of their inherent beauty and worth. In this spirit, we design our buildings with structural integrity, but with an emphasis on aesthetic grace and harmony in material, form, and proportion. The spaces we inhabit are not neutral. At their worst, they hinder and distract; at their best, they shelter us, but they also inspire--they help us along our journey to realize our human potential. First we shape our buildings, afterwards they shape us. Once the design has been finalized and timber has been milled and seasoned, production can begin in our workshop in Liberty, Maine. This usually includes timber preparation, lofting, layout, joinery, pre-fitting, hand-planing or sanding, and finishing. Our frames and other woodwork can be transported for assembly anywhere: a typical house frame involves between two and four months of shop production, with around a week of on-site assembly. Haystack Joinery encourages the use of low-input, locally sourced building materials wherever possible. Here in Maine, many of our clients own acreage and want to utilize timber procured from their own forest. We have a number of loggers that we trust and can recommend, including horse loggers that are able to work discretely in sensitive areas. 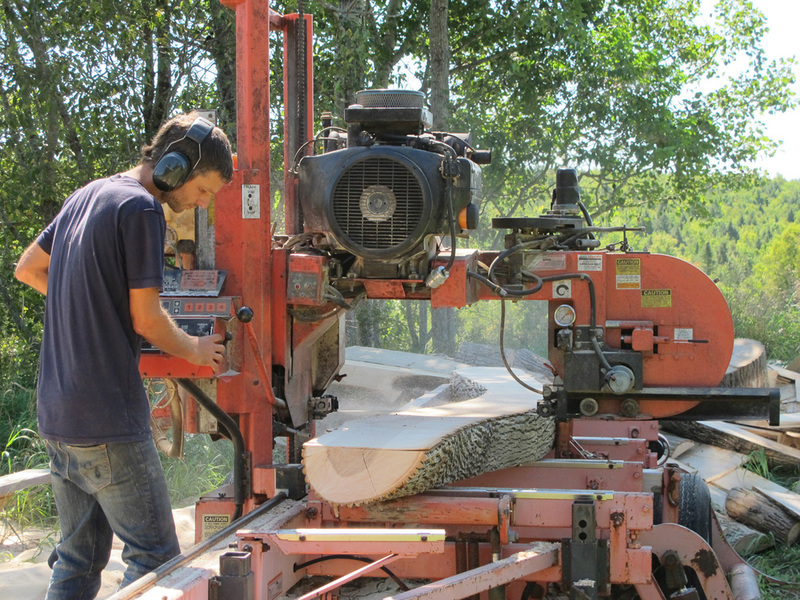 We work with sawyers that use portable sawmills that can be hauled anywhere to mill timber and boards in the woodlot itself. We also source new timber from local sawmills that buy logs harvested in the area, cutting down on transportation and supporting the local economy. For specialty timbers such as crooked knee braces and larger curved timbers we work directly with local log yards and loggers who keep an eye out for the right tree. We also operate our own sawmill for custom sawing curved planks and timbers, as well as other custom timbers such as gunstock posts, and reclaimed wood other sawyers won't touch. Reclaimed timber is more expensive than new wood, but it is dry and stable, and can add a measure of depth and beauty to a frame or piece of furniture that can only be achieved with decades or centuries of wear and weather. In addition to old mill timber, salvaged hewn or rough sawn barn timbers can be reworked into new frames to beautiful effect. Eastern White pine is the most widely available high-quality framing lumber available in our region, followed by eastern hemlock, white spruce and red oak. However, there are many other species that have a place in a timber frame, and we encourage the use of less commonly utilized species such as ash, beech, birch, maple, locust, cherry and cedar. Each species has its own intrinsic characteristics and appearance, and an accordingly appropriate placement within a structural framework. Bracestock tends to be small diameter and is usually cut from dense, strong hardwood such as oak or ash. Other timber species, such as cedar and locust are rot-resistant and particularly well-suited to exposed locations where they can replace toxic pressure-treated lumber.